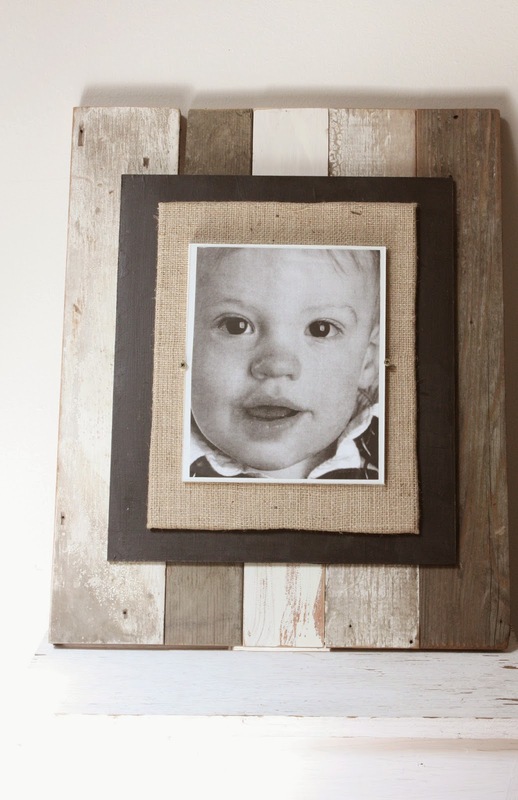 This weeks thrifty Thursday project includes more scrap wood. 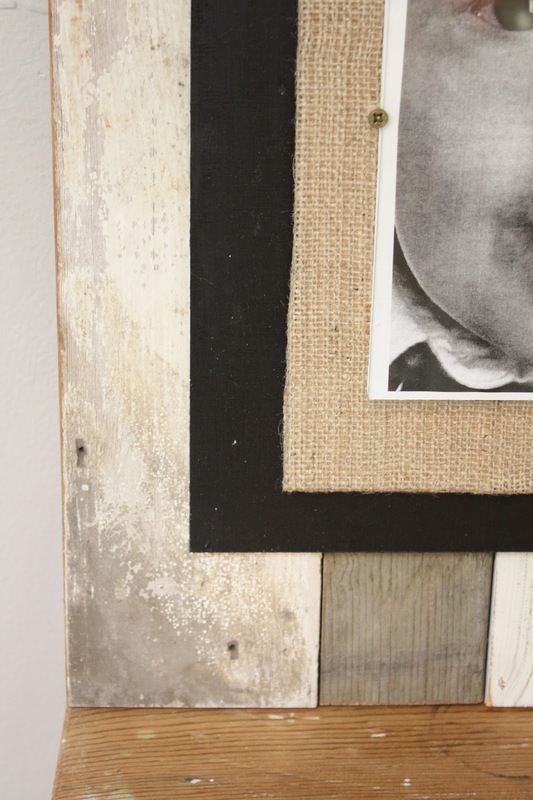 You can use new wood, painted and distressed to look old, or you can use old pallets, barn wood, etc. 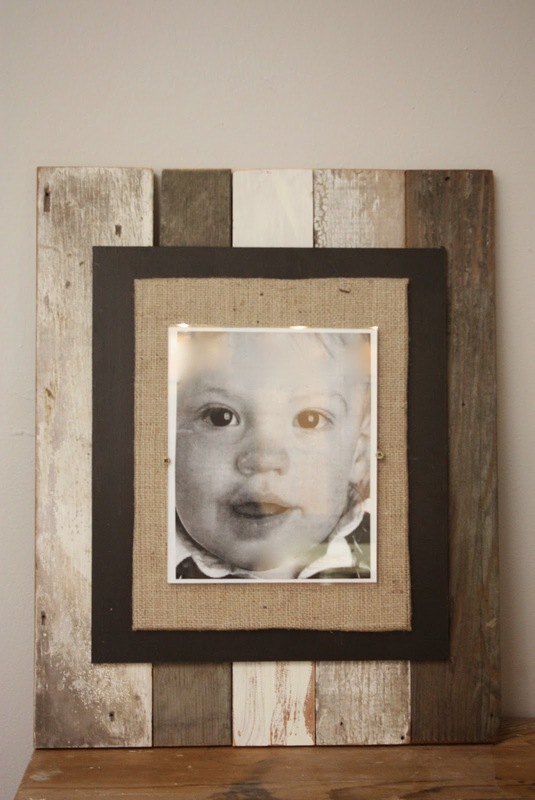 Besides the scrap wood you will also need white paint, black paint, spray adhesive, glass, 2 screws, mdf, and burlap. was to line all my scrap wood up and then cut them all to length. There was no rhyme or reason to how long or wide each piece was, I just eyeballed it. 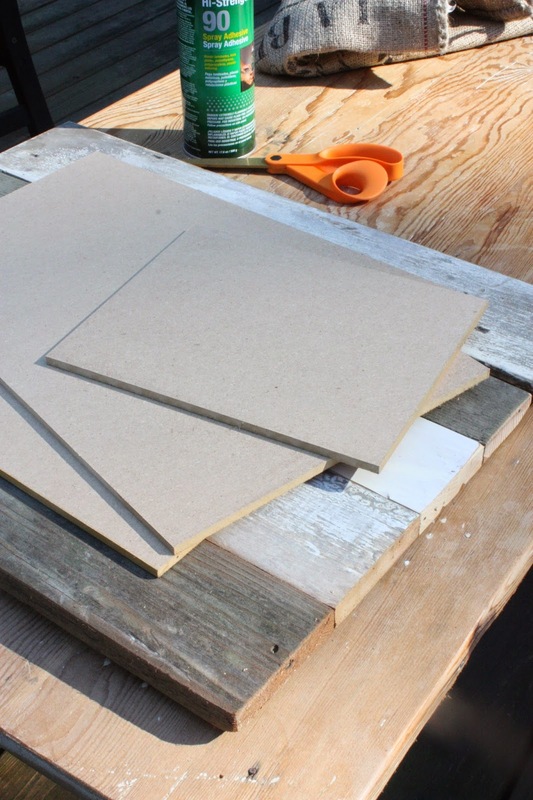 You will want to figure how big you want your glass to be before cutting the mdf pieces. I used a piece of 8x10 glass, so I cut one piece that same size, 8x10. Then I cut another one slightly bigger. Again, I eyeballed it. Then I cut a third piece slightly bigger than that. Lay everything out like in the photo below. 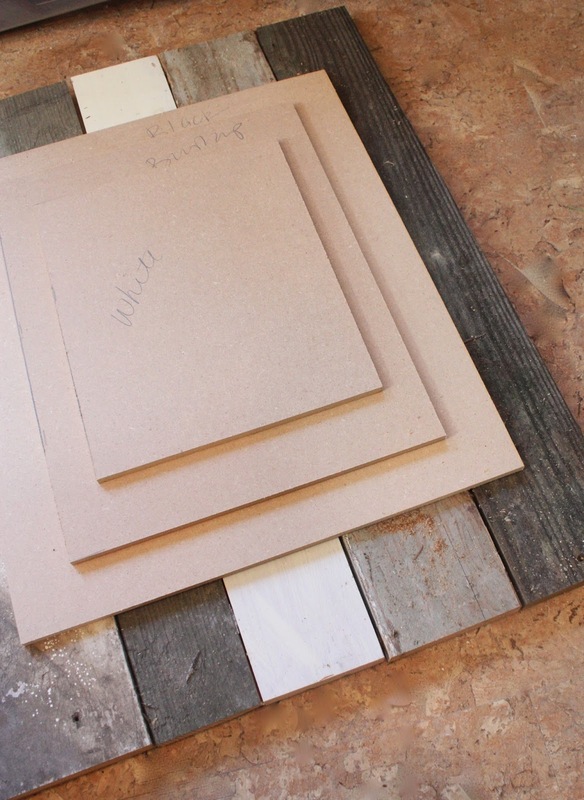 You are going to paint one piece of mdf white, one black, and you are going to cover one in burlap. I wrote with pencil on each one so I wouldn't accidentally paint one the wrong color. I should back up here and say that I added strips of mdf to the back and used wood glue and screws to hold my scrap wood pieces together, running them horizontally. Sorry, didn't get a picture of that ever. Do I win a prize for worst tutorial? OK, now gather your spray adhesive and all your materials. Paint your black and white pieces and set aside to dry. bigger than your middle piece of mdf. 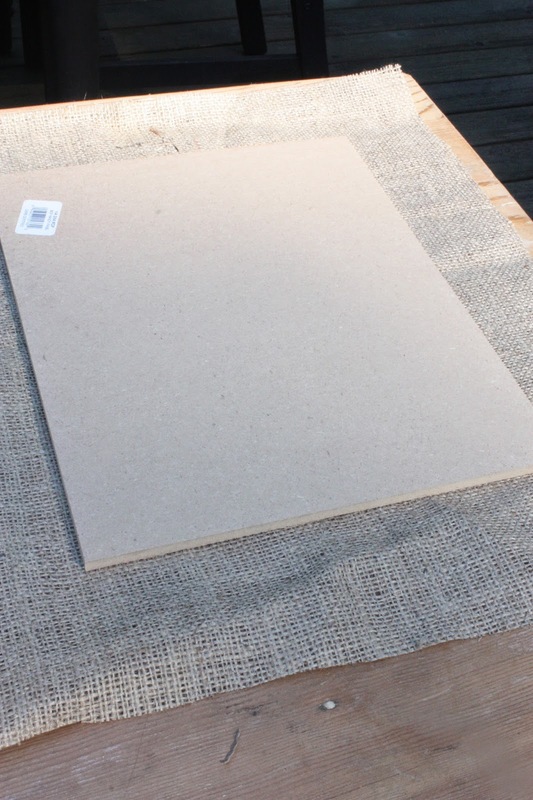 Outdoors, spray the burlap and the mdf with spray adhesive and fold over and wrap like a present. Now you can put all your pieces together. 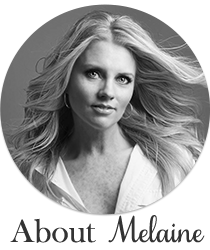 I used a air nailer with short nails. Lay out your scrap pieces then place your black painted piece and nail into place. 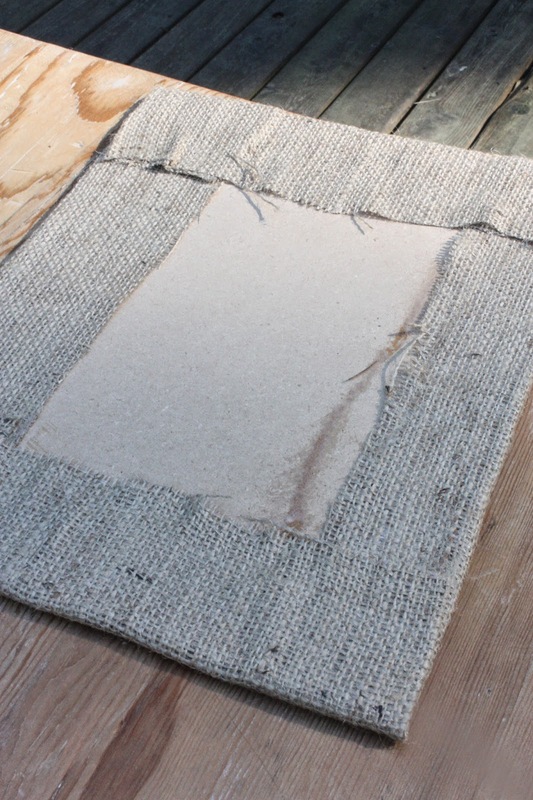 Next, lay the burlap piece on top, then the white piece, attaching each one. Then you can add a photo. I cut my 8 x10 photo down a bit so the white wood showed. This is also just a photo copy. Place your glass on top. Instead of getting a piece of glass cut, consider picking up a ugly frame at a thrift store for around 99 cents and using the glass out of it. Now, I used 2 screws on either side of the glass to hold in place. However, I think it looks ugly and am currently trying to find other ways to attach it that looks a little nicer. I have made similar frames. I used plexiglass and drilled holes into it and then put screws in the holes. These are cute! Indeed, a great idea! I have made one of my new cabin and thanks to you that I’m inspired to finish it! I love the style of wood, even though it’s too simple to look at. The Step by step process is effective! Attractive! Love these frames. I use flat type speed nuts and screw them in with a tiny black screw. They'll have them at any home improvement store.